I believe in me time. I feel everyone deserves it no matter what. 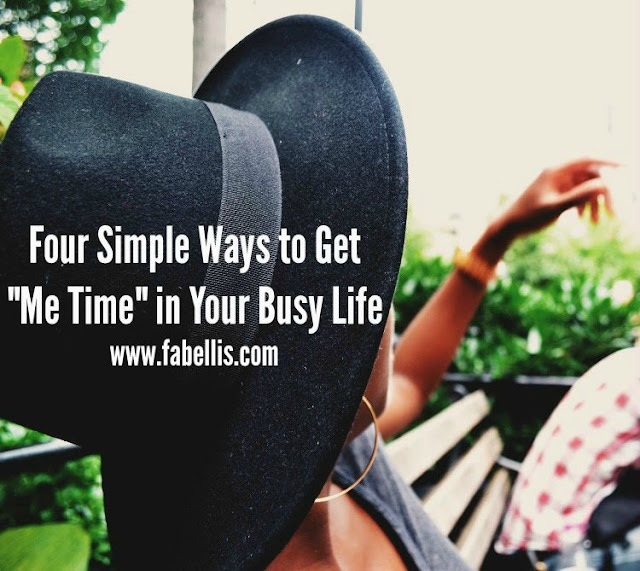 I quickly discovered after getting married that it wouldn't be quite as easy to get in me time as it was before. The truth is...we're busy. Life is busy. I'm working full time, maintaining FabEllis, working on my health, trying to cook more, keep our home clean and on top of that, be an awesome wife. I'm sure the list goes on for you too and with all we have to do daily, it's hard to get in me time for yourself. Now that my husband and I have successfully made it through year one of marriage, I have learned not only a lot about our relationship, but great ways to fit me time in when I need it. The great thing about the following ways to get more me time in your life is that they work for men and women and don't all require money. 1. Take yourself out to lunch. This is one of my favorite ways to get me time in and the best part is that it's easy and doesn't take away from your family time. If you're like me, I get an hour lunch Monday through Friday. I love driving to a local eatery and having lunch by myself. It gives me time to think, people watch and even look at social media on my phone. It's simple, but it allows me to really clear my mind. Also, you don't have to spend money. At a previous job, when the weather was cooler, I'd make my lunch at home, take it to work and eat it in my car. 2. Get a manicure or pedicure...or both! Listen... Manicures and pedicures are awesome. Not only do they leave your nails looking great, they can be very relaxing. The massages they giving during a manicure and pedicure feel great. It gives you a moment to get pampered and enjoy yourself. 3. Try to get up 30 minutes before everyone else. There is something simply glorious about quiet, still mornings. One of the best tips I have ever been given is simply getting up earlier. It's such a simple way for getting in your me time. Before the kids, husband or anyone in your home gets up, get up 30 minutes before their typical time. You can spend this time watching your favorite show, sipping your favorite drink, reading or whatever you like. It's a prime time to reflect and get ready for the day. 4. Take an exercise class with friends. While I have been on my healthy living journey, I have discovered that it's easier and more fun with friends. Although you may not think me time includes others, your time can include others if you're doing something YOU want to do. I have been able to enjoy zumba with friends and it was wonderful because I was working on a personal goal and having fun. What are ways you get me time in during the week?